Exciting news, lovers of Lego and the rock star wannabe game (no, not Guitar Hero) otherwise known as Rock Band. A fusion of Lego and Rock Band could be on the horizon. Now, Lego and Rock Band aren’t two things you’d necessarily wed together, but word on the web is Travellers Tales is working on a Lego version of Rock Band for EA, so clearly there’s a bunch of people out there who think it can be done (and who must really love Lego). This’ll be an interesting collaboration as there is absolutely nothing RAWK about Lego at all – unless you dress them up in teeny little rock band outfits (awww so cute) of course. 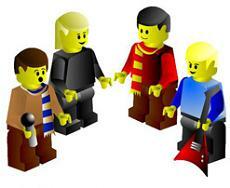 Word on the web also says this fusion of plastic bricks, Lego hair and rocking out is a hoax. However, the gaming blog VG247 insists the news in “100 percent correct”. An interview on BBC Radio One confirmed that the company was working on another Lego title but didn’t confirm its identity. So could it be? We’re yet to hear confirmation from EA and Travellers Tales themselves, but doesn’t the possibility sound fun?